Lesley Batchelor OBE is an expert on international trade and a passionate champion of UK exporters. She is also the Director General of the Institute of Export, the professional membership body representing and supporting the interests of everyone involved in importing, exporting and international trade. She hear tells you how to use a market weighting table to select your export market. One of the keys to success in an international market is the choice of market to work in. It’s important to have a good sound rationale behind your decision and a properly thought through market strategy – over the years as an adviser I’ve heard some bizarre reasons for going to a new market, but don’t be swayed by the great golf or the fact that a lot of the population speak English! You really have to think carefully about the markets that might be viable for your company. If you are at an early stage researching your markets, I’d recommend reading the Open to Export articles on getting started with market research and guidelines for conducting market research after reading this article. 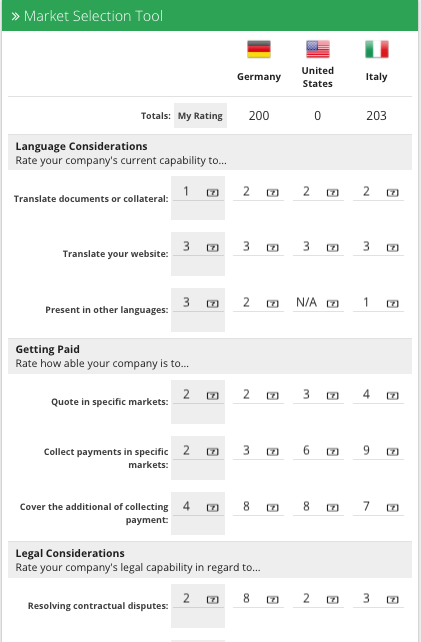 Above is a very basic way of quantifying a decision by using a simple weighting table – it’s a very useful marketing and strategy technique which I definitely recommend and we’ve created an online version of the tool which you can complete when filling out your Export Action Plan. Start by looking at your competitors, the local press and asking people from your trade association who understand the business environment for your product/service. Which countries come up in the conversations? 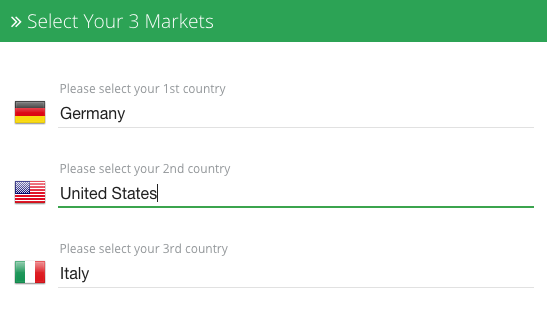 Select your top 3 countries and place. In the example below, I’ve selected Germany, the USA and Italy. Then think about the things that your company needs to have in place to operate in any international market and place them along the top as headings. For example, the main issue for any company must be getting paid, so the weighting table must show how important on a scale of 1-10 it is to your company to get paid. Assuming that you want to stay in business it should be a 10! Looking at the markets again, let’s pretend we’re looking at Germany as one possible market. We would rate a German company as most likely to pay so therefore their rating would sit at around 9. When you come to calculate the table, the 10 of your importance rating is multiplied by the 9 of the likelihood of getting paid and generate value of 90 towards Germany as a likely market. This exercise is carried out throughout the skills you’ve identified your company will need. Languages are important but you may already have a linguist working for you or a mother tongue speaking in another department. Think also about any possible registrations or modifications you might need to make to your offering and your ability to do these. Likewise the paperwork takes varying amounts of time and also a particular skillset to complete, so you need to think about how important it is to the success of the project and then weight it accordingly. Do bear in mind that in some countries you may jeopardise getting paid if your documentation is not correct. I’d recommend reading Open to Export articles on the role of translation in entering new markets, producing foreign language documents, and the best approach to modifying your product to ensure you are properly prepared when exporting to a new country. A basic market selection table is a very useful tool in decision-making and also a useful tool when trying to convince someone else, be it a bank or your chairman, that you have made your decision in a logical way. Who knows, you might get that round of golf in after all!